Kadowaki-san was focused on making the girls look romantic at points. She tells stories about how she conveyed her passionate thoughts for the work and the characters here. We speak to her about the highlights of the part she worked on as well as cuts she focused on. – Please tell us your impressions of the manga when you first read it. I prepared myself to think it was a manga about light music, but it was really a tea time manga instead! (laughs) I was in a small club that only had girls in it during high school, so I was quite familiar with entertaining yourself in the clubroom. – Could you tell us about your drawing plans and way of thought regarding the series? Also, what did you talk to director Yamada about during the TV series? I worked to keep them appearing like girls no matter what with their expressions and gestures. I didn’t want them to just be girlish; I wanted to show them acting like close girl friends as well. My lecture from director Yamada about Yui’s retreating figure was quite impressive. – What were your thoughts when you first heard that the series was being made into a movie? – As you were working on the film, what did you talk to director Yamada about? During production, we had many discussions over the primary point of a page. Each time I would have her check it, she’d comment like “make it this expression” and discuss the meaning of that cut until I understood their feelings and put that clearly into the drawing. I drew a lot of images. – What part of the movie were you assigned to work as an animation director? – Which portions of the movie did you add force into and what portions did you change how the drawings appeared from the TV series? My drawings have changed from the time the TV series was made, so as a result all the movie’s drawings have changed. Also, I intentionally added more lines (especially on hair). I would sometimes redraw something over and over again until it conveyed that sometimes the girls had a romantic expression on their faces. – What did you keep in mind while working as an animation director for the movie and what were you focused on? I was always focused on making my drawings appear as close as can be to (how Horiguchi-san’s drawings look now). I would frequently sneak over to the key animator’s desks and look at the Chief AD’s correction sheets. Every time I would be shocked and slink back to my own desk thinking “It’s different!” Though due to changing from the time we started working on the movie, I was able to make changes during the key frame check period. – What are your favorite scene(s) in your part and what scenes did you focus on? 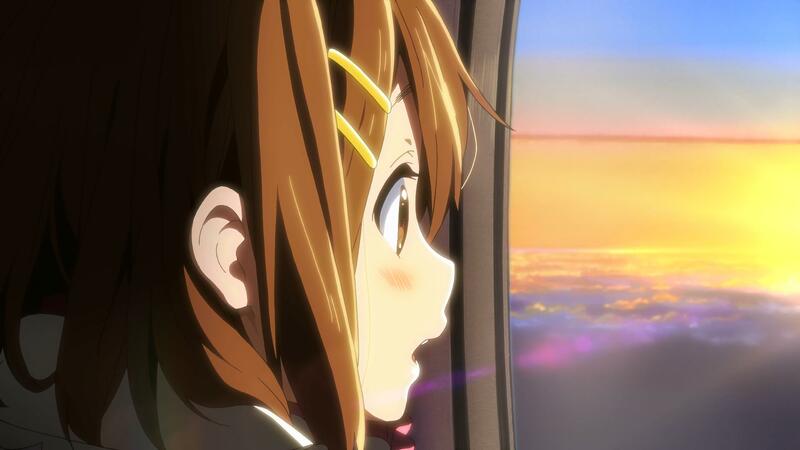 The scene when Yui wakes up in the airplane and looks outside. I wanted to draw her cute, yet looking romantic at the same time. I kept thinking how her hair should get caught in the eyemask. It’s a peaceful movement that the key animator was able to do wonderfully. The cut where Mugi makes a strange face and goes “harrumph” is my favorite of all of them! One of Kadowaki-san’s favorite scenes is where Yui wakes up and looks outside the airplane window at the sunrise colors. Yui looks more romantic than usual. The disheveled hair also makes her look amorous. – What are your favorite scenes outside your part? 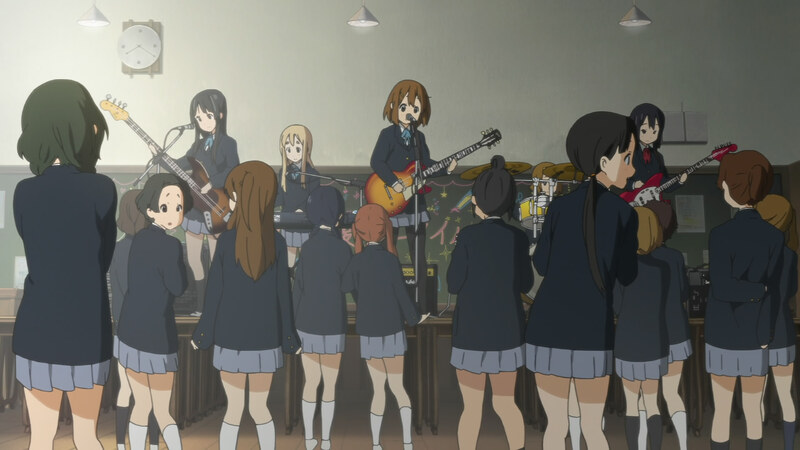 Sawa-chan’s flashback scene once the classroom concert gets okayed. Sawa-chan cries having worked so hard to have the girls experience something that was harsh for her. Also I like the scene in the London concert where Yui spots a baby. Babies are so cute! – Having worked alongside her for three years, what type of director do you see director Yamada being? – What are your thoughts on the K-On! series, having gone through these three years? We’ve really gone through three years, haven’t we…. Surely it can’t just be me who feels like we just experienced high school life with the girls. A fumbling around first year. Getting close second year. Teary farewell third year. Thank you for all the fond memories. – Please give a final message to the fans. It makes me happy that no matter how many years pass, we can always return to the graduation album. Thank you all for your support! Miku Kadowaki Animator at Kyoto Animation. Notable works include chief animation director for Kyoukai no Kanata and designing characters for Kyoukai no Kanata and Amagi Brilliant Park. This entry was posted in K-On!, Kyoto Animation, Translations and tagged b-part-animation-director, k-on, kadowaki, miku, movie, Translation. Bookmark the permalink.